I seem to enjoy a bit of cooking these days! This is pretty much a portion of my web site devoted to various statements, pictures and questions about this new found hobby, interest, passing phase or what ever you would like to call it. 7/20/2011 – Chasing cod aka cod, where art thou? That had LOTS of fresh fish for me and an excellent grouper sandwich as well! That was Monday nights dinner. Just had to throw in the back story you know. 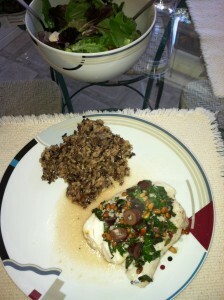 Tonight for dinner we had experimental food: cod roasted with olives and basil with a side of wild rice and a salad. It turned out pretty good! The recipe is one that I got from a Williams Sonoma cookbook and needed no tweaking at all. The cod fillets I got were a bit on the large side so I had to adjust for that in the cooking time – Brett showed me how to check the fish for doneness – The olives worked really well with the fish. I was pretty happy with the turn out. The rice was wild rice, I am generally not a fan of anything but white rice, but this worked so well with the fish I might try this with other dishes every once in a while. It is a combination of several different kinds of rice and took a whopping 50 minutes to cook! The salad – basic, but full of flavour thanks to various organic ingredients. More about the organic side in a different post. I think this meal is a keeper – at least in the top 25 – Perhaps I will try with a different fish and saffron rice next time. I love my rice! Here is a picture of the end result! I want to go to the seafood market, I keep forgetting about it. Road trip!